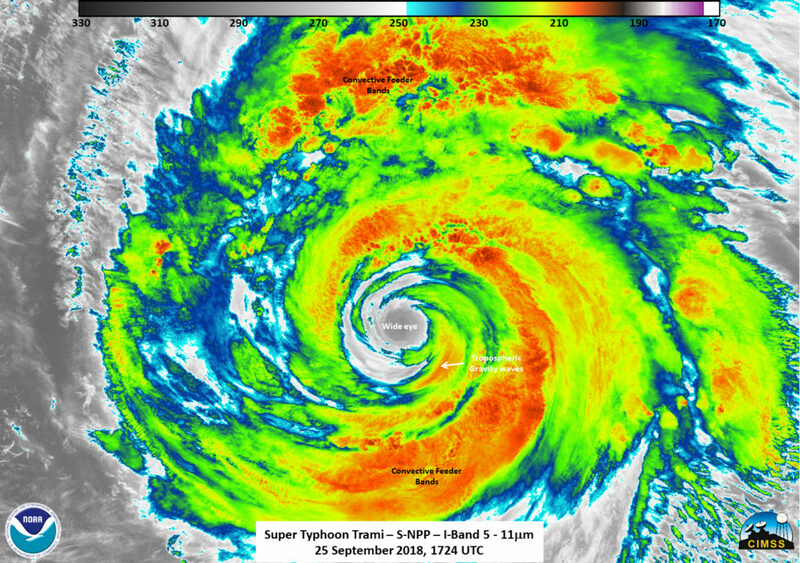 Typhoon Trami looked formidable in infrared imagery taken from NASA-NOAA’s Suomi NPP satellite as it moves to the southern Islands of Japan. NASA-NOAA’s Suomi NPP satellite provided forecasters with a night-time and infrared look at Trami’s clouds on Sept. 25 at 1724 UTC (1:24 p.m. EDT). Cloud top temperatures were near 190 Kelvin/ minus 117.7 degrees Fahrenheit / minus 83.5 degrees Celsius around the eye of the storm. Cloud tops that cold can produce heavy rainfall. At 11 a.m. EDT (1500 UTC) Trami’s center was located near latitude 21.3 North, longitude 129.3 West. That’s about 321 nautical miles south-southeast of Kadena Air Base, Okinawa, Japan. Maximum sustained winds are near 103 mph (90 knots/166 kph) with higher gusts. The Joint Typhoon Warning Center forecast calls for Trami to weaken slowly as the storm moves slowly north. The storm will then re-strengthen to 110 knots, after which it will become extra-tropical. The typhoon will become extra-tropical on passing Honshu.